Life’s not such a beach for Galapagos native species these days. Native species are particularly vulnerable on islands, because when invaders such as rats arrive, the native species have nowhere else to go and may lack the ability to fend them off. The main characteristic of an island is its isolation. Whether just off the coast or hundreds of kilometres from the nearest land, they stand on their own. Because of their isolation, islands generally have a unique array of plant and animal species, many of which are found nowhere else. And that makes all islands one of a kind. However, islands, despite being geographically isolated, are now part of a network. They are globally connected to the outside world by planes, boats and people. Their isolation has been breached, offering a pathway for introduced species to invade. The Galapagos Islands, 1,000km off the coast of Ecuador, provide a great example. So far, 1,579 introduced species have been documented on the Galapagos Islands, of which 98% arrived with humans, either intentionally or accidentally. More than 70% of these species have arrived since the 1970s – when Galapagos first became a tourist destination – an average of 27 introduced species per year for the past 40 years. by 2020, invasive alien species and pathways are identified and prioritised, priority species are controlled or eradicated and measures are in place to manage pathways to prevent their introduction and establishment. The Galapagos Islands are home to giant tortoises, flightless cormorants, and the iconic Darwin’s finches – species that have evolved in isolation and according to the differing characteristics of each of the islands. However, the Galapagos’ natural attributes have also made these islands a top tourist destination. Ironically enough, this threatens the survival of many of the species that make this place so unique. In 1950 the Galapagos Islands had just 1,346 residents, and no tourists. In 2015 more than 220,000 visitors travelled to the islands. These tourists, along with the 25,000 local residents, need to have most of their food and other goods shipped from mainland Ecuador. These strengthening links between Galapagos and the mainland have opened up pathways for the arrival and spread of introduced species to the archipelago, and between its various islands. Major species transport routes into and between the Galapagos Islands. More and more alien species are finding their way to the Galapagos Islands. Plants were the most common type of introduced species, followed by insects. 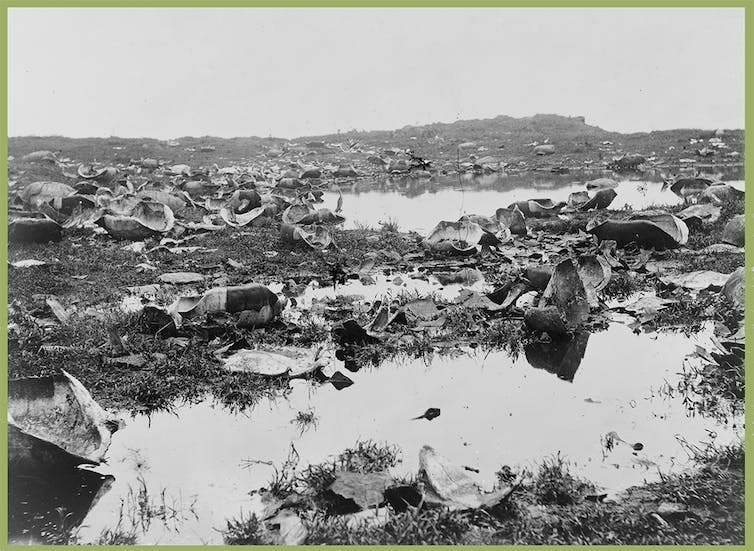 The most common pathway for species introduction unintentionally was as a contaminant on plants. A few vertebrates have also been recorded as stowaways in transport vehicles, including snakes and opossums; whilst others have been deliberately introduced in the last decade (such as Tilapia, dog breeds and goldfishes). The number, frequency and geographic origin of alien invasion pathways to Galapagos have increased through time. Our research shows a tight relationship between the number of pathways and the ongoing increase in human population in Galapagos, from both residents and tourists. For instance, the number of flights has increased from 74 flights a week in 2010 to 107 in 2015; the number of airplane passengers has also increased through time with about 40% being tourists, the remainder being Galapagos residents or transient workers. Global connections between Galapagos and the outside world have also increased, receiving visitors from 93 countries in 2010 to 158 in 2014. In 2015 and 2016, the Galapagos Biosecurity Agency intercepted more than 14,000 banned items, almost 70% of which were brought in by tourists. We think it likely that intentional introductions of alien species will decline when biosecurity is strengthened. However, with tourists as known vectors for introduced species and with tourism much the largest and fastest growing sector of the local economy, unintentional introductions to Galapagos will almost certainly increase further. If islands are to be kept as islands, isolated in the full sense of the word, it is of high priority to manage their invasion pathways. Our research aims to provide technical input to local decision makers, managers and conservation bodies working in Galapagos in order to minimise a further increase on the number of available pathways to Galapagos and the probable likelihood of new arrivals. 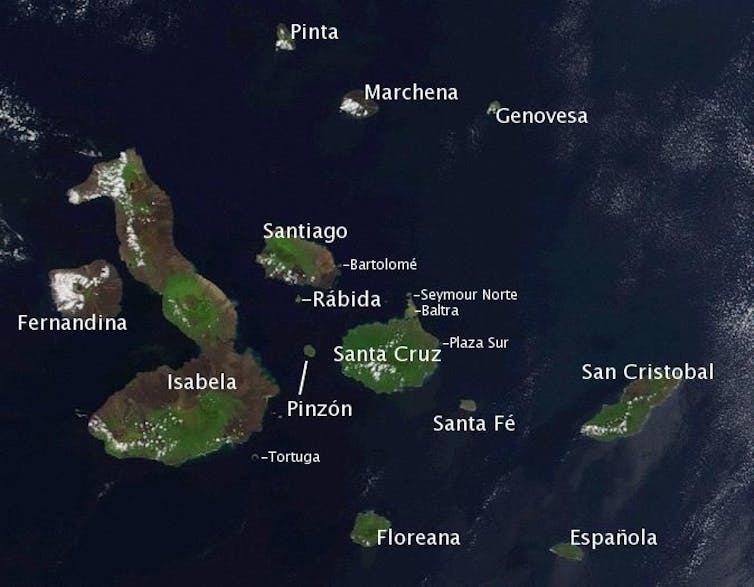 Our next step is to evaluate how local tourism boats are connecting the once isolated islands within Galapagos, as a way to minimise further spread of harmful introduced species to this UNESCO World Heritage Site. Giant tortoise on Pinzon Island, Galapagos. Remains of tortoises killed by hunters, Galapagos Islands, 1903. Removing a Wolf Volcano tortoise from Isabela Island for the Floreana tortoise restoration initiative. The Galápagos Islands, 1,000 kilometres off the coast of South America, are probably most famous as the place that inspired Charles Darwin’s theory of evolution. They are home to an extraordinary array of wildlife, including giant Galápagos tortoises, the world’s largest land-living cold-blooded animals. The tortoises once thrived in the archipelago. There were originally 15 species that evolved as the islands formed volcanically. However, since the arrival of people four species have become extinct. A few weeks ago we returned from an expedition to the islands in search of two of these extinct species of tortoises. It may sound like a fool’s errand, but our expedition was a success. The Galápagos Islands were colonised in the late 1800s. A combination of poaching by whalers and pirates, and introduced pests competing for food and eating eggs and hatchlings, led to tortoises being exterminated on some islands, and dramatically reduced on others. Lonesome George, photographed before his death at the age of about 100. 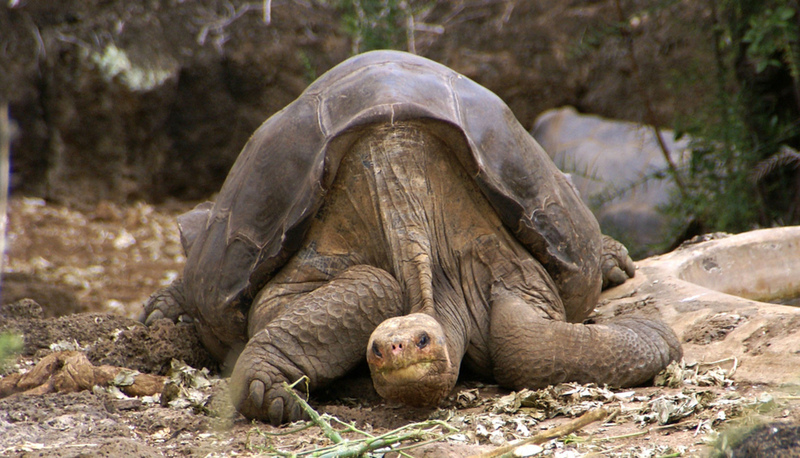 Darwin wrote about the harvesting of the species of tortoise found only on Floreana Island (Chelonoidis elephantopus), which was exterminated within 15 years of his visit to the Galápagos in 1835. The tortoise found only on Pinta Island (Chelonoidis abingdoni) went formally extinct in 2012, when its last representative, a male held in captivity and nicknamed Lonesome George, died. He was a major conservation icon and at one point considered by Guinness World Records as the world’s rarest living creature. Ten years ago our genetic research program made a very surprising discovery. 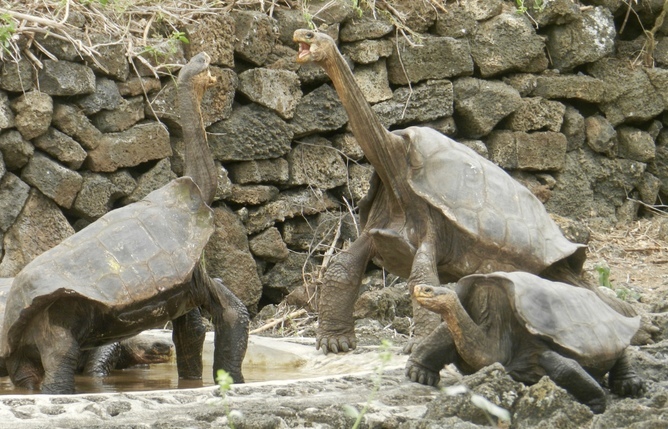 Some tortoises on Volcano Wolf, on Isabela Island, didn’t match others normally found on the volcano (Chelonoidis becki). Instead, their DNA matched that of the extinct species from Floreana and Pinta. Volcano Wolf – the highest point of the Galápagos Islands. These exciting discoveries led to an expedition on Volcano Wolf in 2008, where we tagged and sampled over 1,600 tortoises. DNA analyses revealed an astonishingly large number of tortoises with mixed genetic ancestry in this sample: 89 with DNA from Floreana and 17 with DNA from Pinta. It is likely that people have been moving tortoises around the islands. Old logbooks from the whaling industry indicate that, in order to lighten the burden of their ships, whalers and pirates dropped large numbers of tortoises in Banks Bay, near Volcano Wolf. These animals were collected from lower altitudes islands (Floreana and Pinta) during centuries of exploitation by whalers and pirates, who made the archipelago a regular stop-off for their crews to stock up on these handy living larders. Many of these tortoises made it to shore and eventually mated with the native Volcano Wolf species, producing hybrids that still maintain the distinctive saddleback shell found in the species from Floreana and Pinta. These hybrids include animals whose parents represent purebred individuals of the two extinct species. Our recent expedition was aimed at finding the animals with a high proportion of ancestors from Floreana or Pinta. It was ambitious, logistically complex, and very strenuous. Our team of park rangers, scientists, and veterinarians from 10 countries were divided in nine groups of three to four people each. The daily mission included patrolling large areas of unstable razor-sharp lava fields and of spiny thick vegetation across Volcano Wolf, the tallest of the Galápagos. Added to this ordeal were the frequent encounters with wasps, the equatorial heat, and an El Niño induced six-day period of non-stop rain. 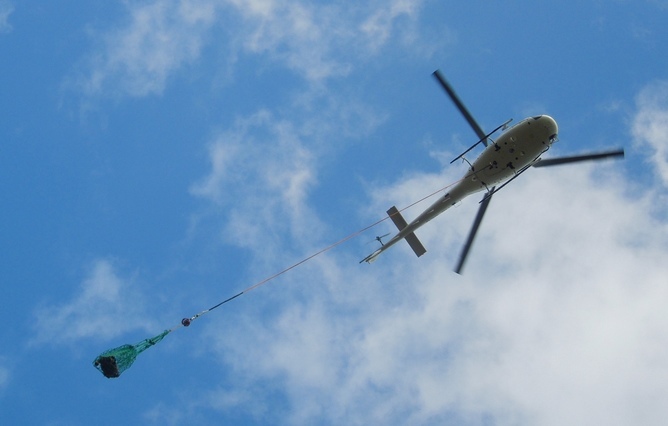 When one of the target tortoises was found, we would contact our mother ship by radio and clear the vegetation of the volcano slopes to make room for the cargo net of our expedition’s helicopter. The precious tortoise would then be moved into the net and airlifted to the ship, which was anchored in Banks Bay. Our teams discovered more than 1,300 tortoises, including nearly 200 that potentially have mixed ancestry from Floreana or Pinta. We airlifted 32 of them to the ship and then to the captive breeding facility of the Galápagos National Park on the island of Santa Cruz. A giant Galápagos tortoise with ancestry of an extinct species being airlifted to our ship. Included in the 32 were four females with Floreana genes and one male and one female from Pinta that were tagged and analysed in 2008. The DNA of these tortoises will be analysed to inform the best breeding strategy. We want to restore as much as possible the genes originally found on Floreana and Pinta. The captive-born offspring of the two extinct species are expected to be released in their native islands within the next five to ten years. Giant tortoises relocated by our expedition from the Volcano Wolf, Isabela Island, to the captive breeding program of the Galápagos National Park, Santa Cruz Island. Reintroduction of these tortoises to the islands where they evolved, together with large-scale habitat restoration efforts, is essential for the restoration of the island ecosystems. These long-lived large herbivores act as “ecosystem engineers”, altering the habitat they live in to the benefit of other species. Wouldn’t low genetic diversity hinder the long-term persistence of reintroduced populations? This is a logical concern for reintroduction programs that rely on a small number of captive breeders. However, giant Galápagos tortoises can bounce back from major demographic crashes and respond well to reintroduction programs. For instance, the Volcano Alcedo tortoise population, arguably the largest in the Galápagos, is derived from a single female lineage thought to have survived a catastrophic volcano eruption in pre-historical times. The reintroduction of over 1,500 captive-born offspring of the species once found on Española Island is another success story. The repatriated Española population, all derived from 15 captive breeders, now seems well-established. Bringing back the Floreana and Pinta species from extinction, something inconceivable not long ago, is now a possibility. 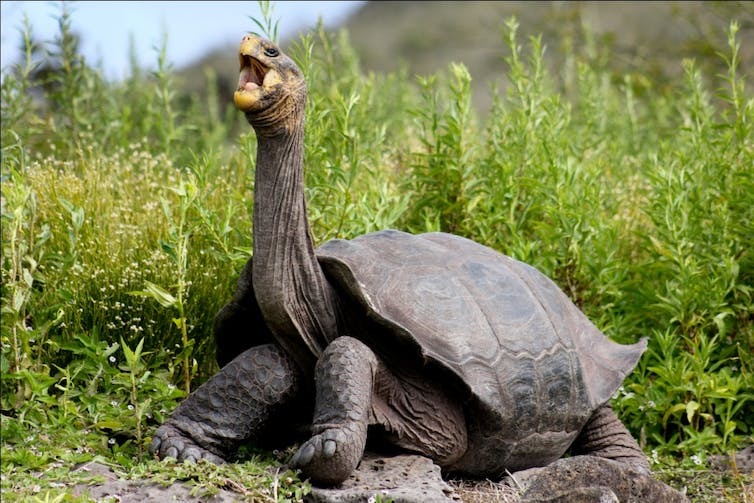 Its appeal is further increased by the fact that our expedition found that many more tortoises with genes from Floreana and Pinta still wander on the slopes of the Volcano Wolf. Adding them to breeding programs will boost the genetic diversity in the released individuals and calls for a new expedition soon to come. We anticipate arduous but rewarding times ahead for giant tortoise conservation biologists.